« Ever drive through a Ballroom? You probably have in Palm Beach. the south side of Banyan Street from Olive Avenue to Narcissus Street. It’s a rather nondescript three-story building built in the 1970s, but in the early 20th century, it was the hot spot of West Palm Beach. 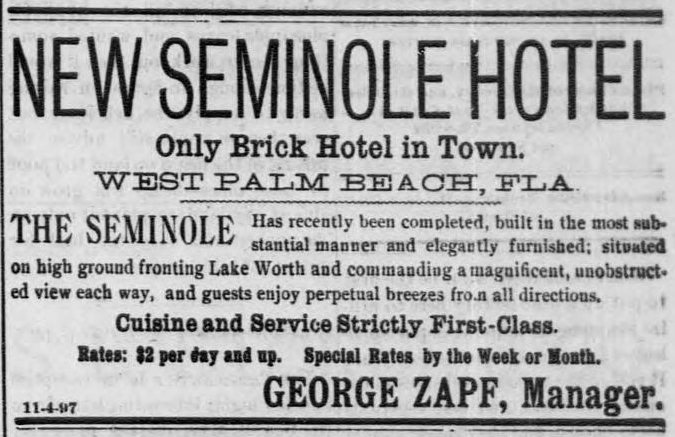 Most famous of all the businesses that were located on this block was George Zapf’s Seminole Hotel, first built in 1894 at the corner of Banyan and Narcissus. 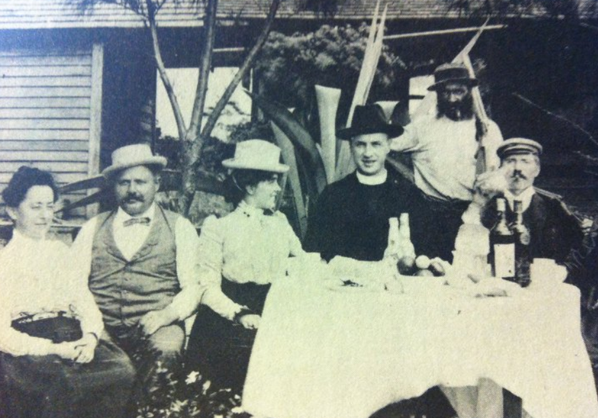 The Zapf family had bottling businesses in many Florida cities including Miami, Jacksonville and West Palm Beach. He was an alderman in the city, and certainly was one of the real characters in early West Palm Beach. The original wood structure burned in the Great Fires of 1896. First, on January 2, 1896 a fire started from an overheated stove in Nicoli and Puckett’s “Midway Plaisance Saloon and Restaurant” and the entire Banyan block was burned. Then on February 20, 1896, the rest of Narcissus Street burned to the south when an oil lamp overturned in a tailor’s shop. 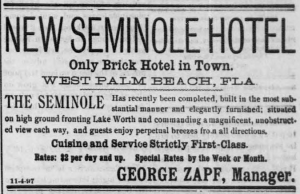 Zapf immediately had the hotel rebuilt, and the new Seminole Hotel was then constructed of brick as a “fireproof” hotel. 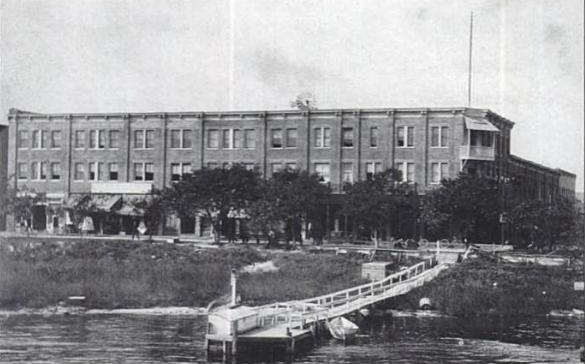 The Seminole Hotel’s street level shops offered many services and businesses such as a lunch room, a tailor and barber shop, billiards, several saloons, cigars and candy, clothing and a drug store. The rest of the Banyan block had restaurants, offices, a grocery store, a bottling works and a Chinese laundry. 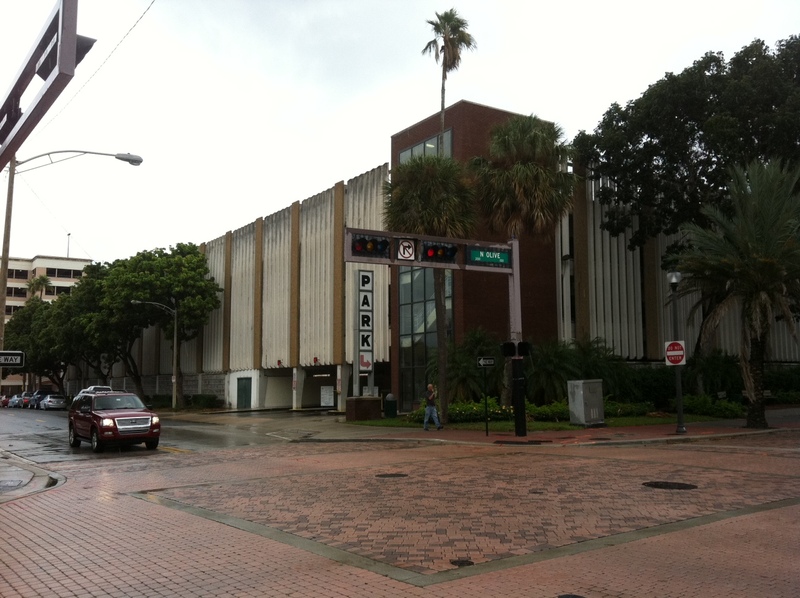 At the corner of Narcissus and Clematis was the Palms Hotel, where the original Anthony Brothers store was located. Of course, it was the saloons on Banyan Street that were the big draw, being the only place in West Palm Beach that served liquor. Many Palm Beachers also came across the bridge to enjoy late night drinking on Banyan. Some even called the street “Whiskey Street” and it drew the ire of Carrie Nation, the crusading leader of the Woman’s Temperance Movement, who showed up with her hatchet to clean up the place. 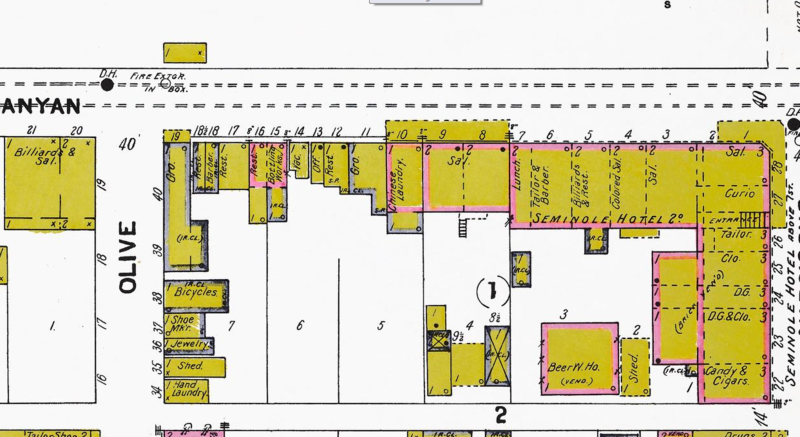 The map of the entire block exactly as it appeared in 1903 is part of the Sanborn Fire Map series for West Palm Beach. These maps were produced to estimate fire insurance rates. Buildings in yellow were wood frame construction, and buildings in red were brick or brick veneer. The types of businesses are noted on the map. Several different years are available online at the University of Florida library (http://ufdc.ufl.edu/?c=SANBORN) and the maps provide a glimpse of how the city grew from 1903 through 1920. Zapf eventually sold the hotel, and it was renamed the Lake Park Hotel. It was razed sometime before 1950, but the exact date of the razing was not indicated in Palm Beach Post articles on the hotel. So next time you park in the Banyan Street garage, think of the people who shopped in the stores, imbibed in some spirits or stayed in the hotel and enjoyed the good times of days past. Perhaps their spirits still walk Banyan Street. This article was researched through the Palm Beach Post Historic archives and the Photographic Collection of the Florida Archives. Banyan Street is indeed a good place for spirits; Messr. Zapf sets a fine table !